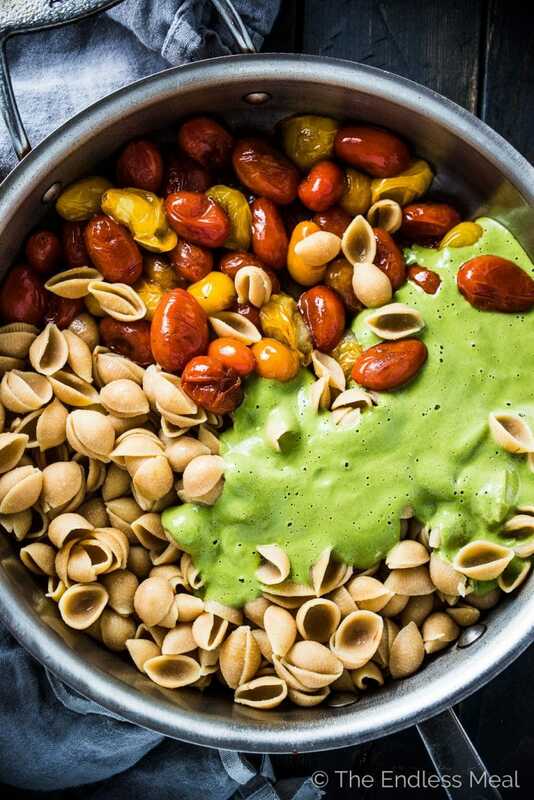 This super simple yet crazy delicious Caprese Pesto Pasta is as good as it gets. The lemony pesto is a creamy blender pesto that is so easy to make. Pour that over pasta and toss with some sauteed cherry tomatoes and mozzarella and dinner is served. 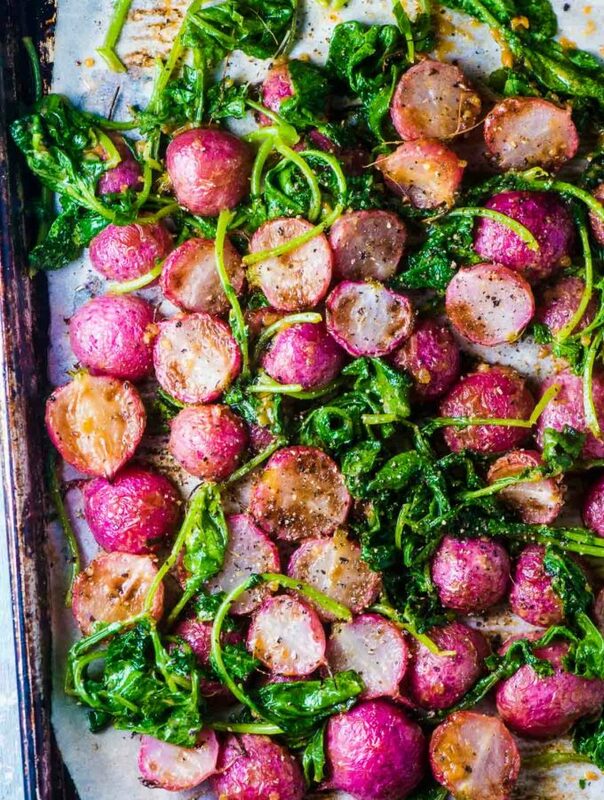 It's the perfect Meatless Monday vegetarian supper recipe. All the stars have aligned, my friends! I am finally sharing my all-time favorite quick and easy pasta recipe. This should have happened years ago. I'm sorry for holding out on you. This is one of those meals that hardly registers as a recipe in our house. It's usually my handsome man who whips up the pesto while I put a pot of water on to boil and quickly sear the tomatoes. 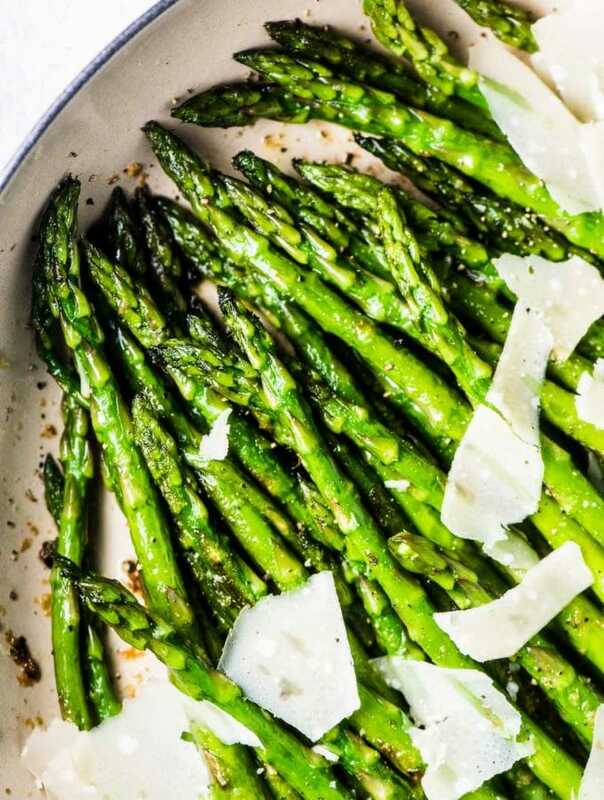 It's what we eat when we're HUNGRY and need to eat right freaking now. It's also a meal we swoon over every time we eat it. Seriously, it's so delicious. Around here we simply call it pesto. 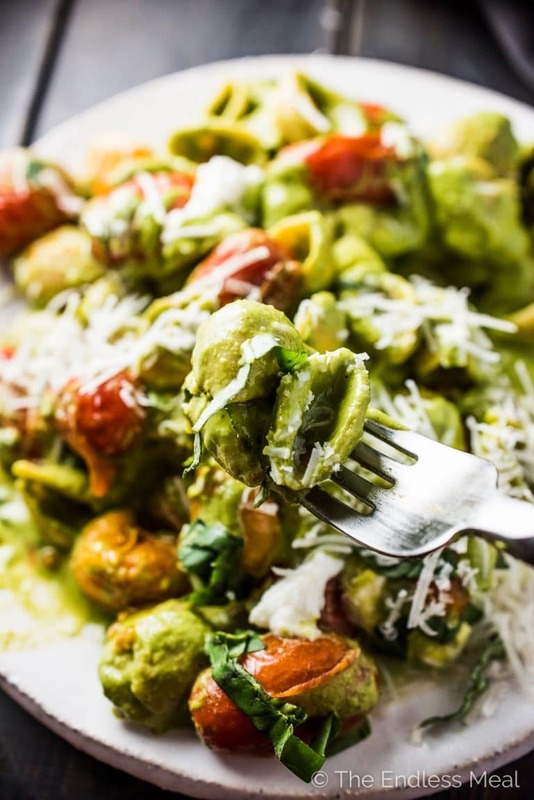 For the sake of fancying things up a little, today I'm calling it Warm Caprese Pesto Pasta. Have you tried Chickapea yet? It's my absolute fav gluten-free pasta. It holds its shape well when cooked and the texture is perfect. It reminds me of whole wheat pasta, which I love. It's made with lentil and chickpeas (that's it!) so it's super healthy for you. Pairing it with a vegetarian or vegan sauce is perfect as Chickapea Pasta is packed full of protein. We often eat their Penne and Spirals, but for this Caprese Pesto Pasta, I love to use their Shells. All the creamy pesto hides inside in the shells so you get lots of pesto. The more pesto the better! The pesto here is all my handsome man's. I can't take credit for it. Before we met, I made pesto quite differently. It was roughly chopped and had lots of texture to it. It was nothing like the brightly colored creamy pesto you see here. → Put everything in a blender and blend until smooth. That's it! I'm totally serious. One step and done. 1. There's parsley in here. And no, that's not a typo. It helps make the pesto the vibrant green color you see. You can leave it out, but it won't be quite as pretty. 2. We don't use pine nuts. Or at least not always. Let's be honest, pine nuts are ridic expensive. While I love them, I can't always bring myself to use them. We've tried many different combinations of nuts and they all work great. We love using half almonds and half walnuts the best. 3. We toast the nuts. Always. It adds so much more flavor to the pesto. 4. There's water in this recipe. This is because the pesto needs to blend freely to get totally smooth and become pourable. You could add more oil, but honestly, water works just as well. For more delicious Chickapea Pasta recipes, make sure to follow The Endless Meal on Facebook. I'll be sharing more great Chickapea recipes from other bloggers there! Put a large pot of salted water on to boil. When it comes to a boil, add the Chickapea Pasta shells, stirring as you pour them into the pot. Cook the pasta for 7-9 minutes then drain and set aside. While the water is heating, prepare the pesto. Place all the pesto ingredients into your blender and blend on high until smooth. Heat the oil in a large saute pan over medium-high heat. Add the cherry tomatoes and quickly toss to coat them in the oil Let them cook undisturbed for 2 minutes then shake the pan and cook them for 2 minutes more. Remove the pan from the heat. Add the cooked pasta, the pesto, and the mozzarella to the pan and stir together. 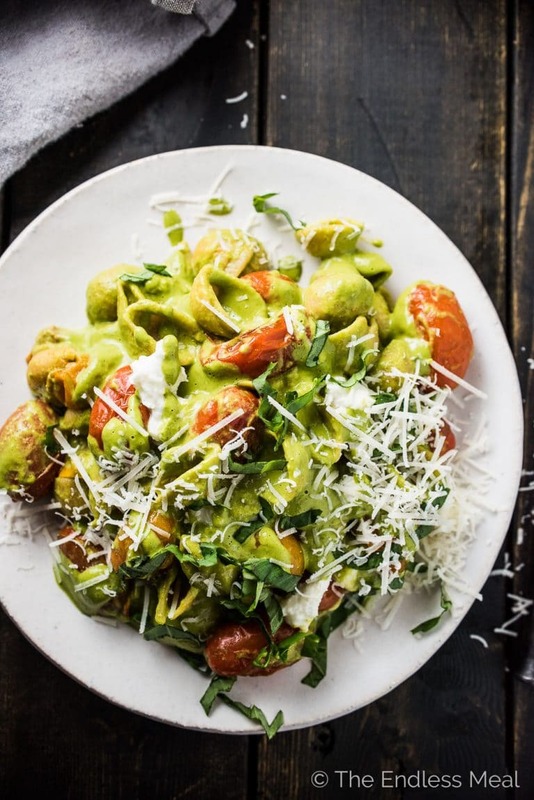 Serve the Warm Caprese Pesto Pasta topped with a little freshly grated parmesan cheese. 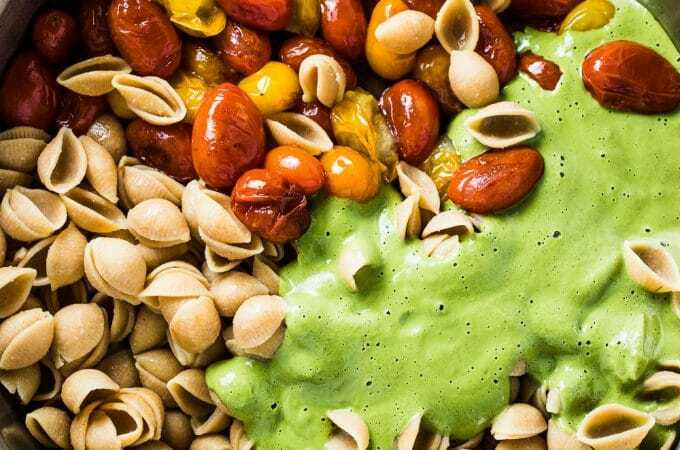 While pine nuts are classic in pesto, other nuts work great. We like a combination of almonds and walnuts the best. Pecans and cashews work great, too. To toast the nuts, place them on a baking sheet in the oven at 350 degrees for 6-7 minutes, or until they are fragrant. To easily make this a vegan recipe, skip the mozzarella use a tablespoon of nutritional yeast instead of the parmesan in the pesto. I made this last night and somehow managed to save some for lunch today. I used some other sort of chickpea pasta – I’ll have to look for Chickapea next time. I had an 8-oz box and cut the rest of the recipe in half. Looking forward to the leftovers! I’m so happy you liked the recipe! Definitely look for Chickapea when you’re shopping for pasta next. They’re my fav! My store doesn’t have it :(. I’ll have to check around. I think I’d prefer the chickpeas and lentils. Mine has chickpea and brown rice flours. Either way, the recipe is awesome,. and pretty simple to throw together. thanks so much! I just saw your message with the links. I’ll check it out! I was back on this page to tell you I just heated up some leftovers of this recipe., which I’ve made numerous times now because I love it so much. Got my own basil and parsley plants now too…… Thanks for all your recipes! You are so welcome! It makes me really happy to hear that you like them! Thank you so much for introducing me to Chickapea. I would never have tried it on my own. Guess I’m not that Adventurous. We really enjoyed it! I’m so happy you gave it a try! Yaaaa another Chickapea convert!!! This is such a great idea!! I love pesto and I love caprese flavors! It’s also feeling like summer already here so I’m really craving this! I can’t wait to try your pesto recipe! Love how creamy and delicious it looks. And chickapea — the shells are my favorite! It’s my absolute favorite pesto recipe! So happy that you like Chickapea Pasta, too!! 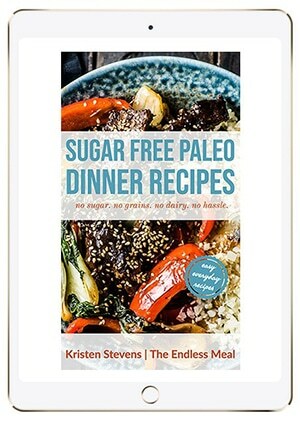 What an amazing recipe, Kristen! I love how simple and healthy it is. Fresh & bright sauce, mixed with creamy mozzarella, succulent tomatoes and healthy Chickapea pasta… Wow! I am just craving it so much! Aww thank you so much! I’m so happy to hear you like it!! It’s such a good trick for keeping the parsley bright, isn’t it?!! I’m loving how smooth and luxe this pesto is! A total must try! It’s my favorite way to make pesto. So creamy! This recipe looks incredible. Can’t wait to try it! Thank you! It really is so good. I hope you love it as much as I do! OMG I need this gorgeous colourful pasta in my life Kristen! So delicious! You do! It’s our fav!! I’d so be the one to dip the cooked pasta into the sauce. Is that weird? Haha it’s not weird at all, girl! Dip away!! It’s our staple vegetarian dish! I hope you love it as much as we do! I’m all about caprese flavors and PESTO! This pasta looks wonderful Kristen! How fresh and bright does this look?!! OMG I am loving how simple it is, yet loaded with flavor and goodness! YUM! You’re totally right … it’s loaded with flavor! Man, I just love pasta and pesto! this beautiful recipe will be delicious all year round and I love the colours! Thanks, Kristen. Chickapea is my favorite pasta too! There’s no better combination, is there? I’m so happy to hear you love Chickapea Pasta, too. It’s my family’s favorite!